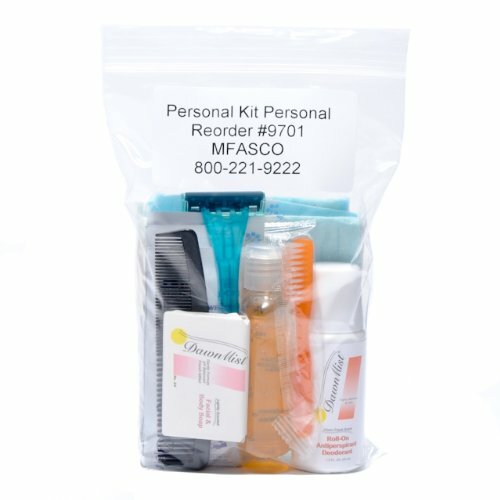 Personal hygiene pack contains personal toiletry items for use when traveling or during disasters or emergencies. Personal hygiene kit includes: 2 disposable washcloths, 1 razor, 1 comb, 1 short handle toothbrush, 9 individual clean wipes, 1 shampoo & body wash 2 oz, 1 antiperspirant/deodorant, 1 bar soap, 1 nail clipper, 1 toothpaste. Keep this hygiene kit in your emergency prepardeness supplies or bug out bag. All hygiene items packed in a ziploc bag.